I’m not an expert, but I do believe there are some football fans in the greater New York area who are in for a serious surprise next Sunday. I hope trauma centers are adding extra staff to deal with the shell-shocked Jets fans who realize the team wearing green on the field is the Packers and not the Jets. I can’t lie, I’ve long imagined that if I were to ever open a local watering hole, these biscuit bites would be our bar nibbles instead of peanuts or pretzels because they go so well with beer and cocktails. 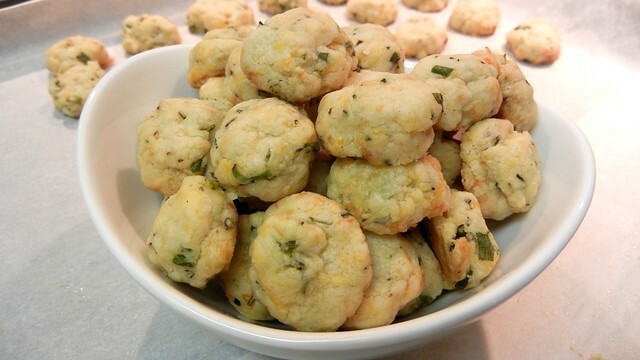 You may be worried that the small dough ball won’t make that many biscuit bites, but this recipe yields about five dozen of these savory little treats. 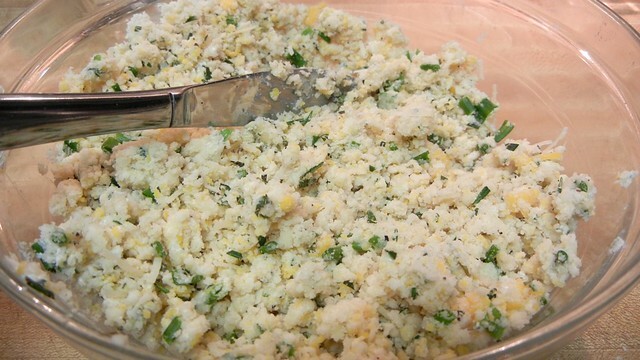 If you’re having a large party, the recipe is easily doubled or even tripled. And if you are not a fan of cheddar, these are very similar to the Parmesan Crisps I posted a couple of years ago, but with sour cream instead of egg. Biscuits and crisps like these are pretty forgiving, so if you want to add more cheese, more herbs or even a dash of paprika or cayenne feel free to play around a bit. 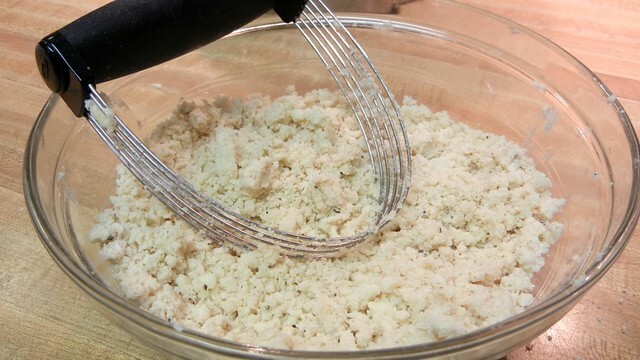 In a large bowl, cut together the butter, flour, salt and pepper with either a pastry blender or with two knives until the dough starts to granulate and take on a “sand” like consistency. 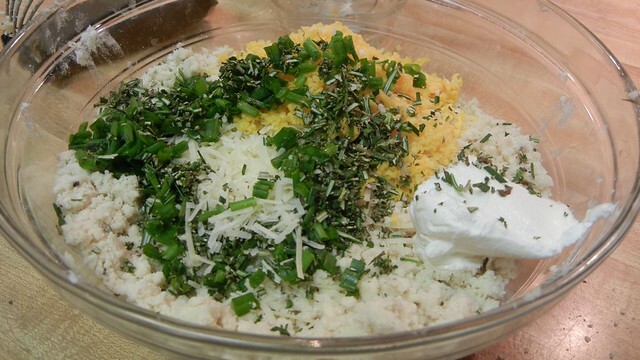 Add in cheese, herbs and sour cream. Using a knife (or two if you’re a ninja or ambidextrous like supposedly Troy Smith is, or David Lee) cut all the ingredients together. Once combined, using your clean hands (why I need to remind you to wash your hands while cooking is beyond me, but every cookbook always says “clean hands” so maybe people are not as clean as I think they are), form into a ball. 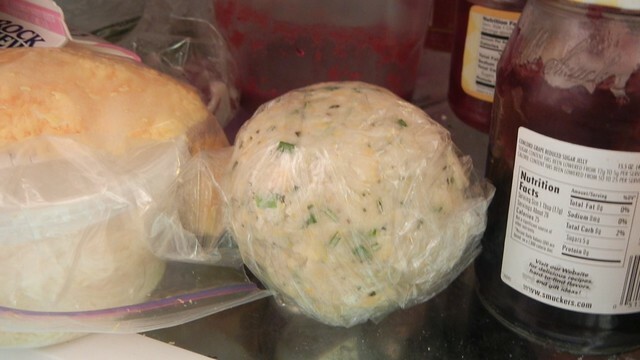 Wrap in plastic or wax paper and let the dough chill for at least thirty minutes. You can also make this dough the day before baking and keep it chilled in the fridge. 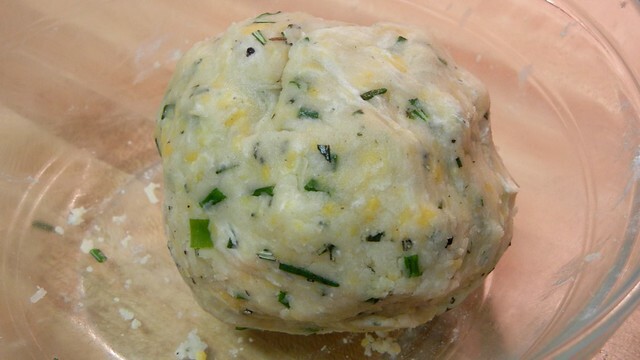 If making ahead of time, I recommend rubbing the dough ball with about a teaspoon of vegetable oil so it does not dry out. Even if you are wrapping it in plastic, the moisture tends to get out somehow if left alone for more than a few hours. Once ready to bake, preheat the oven to 350º. 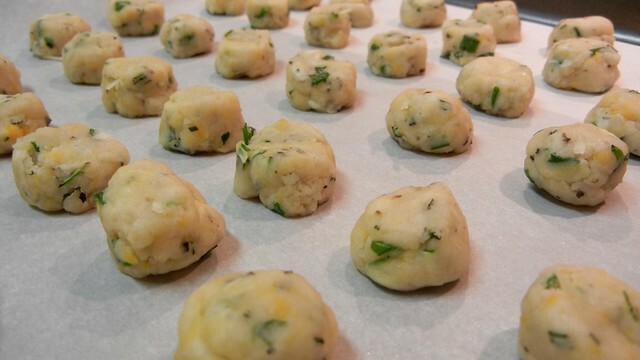 Break the dough into teaspoon-sized flattened balls and place on a lined baking sheet. Bake at 350º until they start to turn golden, about 15 to 20 minutes. Oh. My. Gosh. These look divine. And because i’m southern, i’m brushing these babies in melted butter, Paula Deen style, as soon as they get out of the oven. On a scale of one to ten, how much like the Cheddar Bay Biscuits at Red Lobster do these taste? 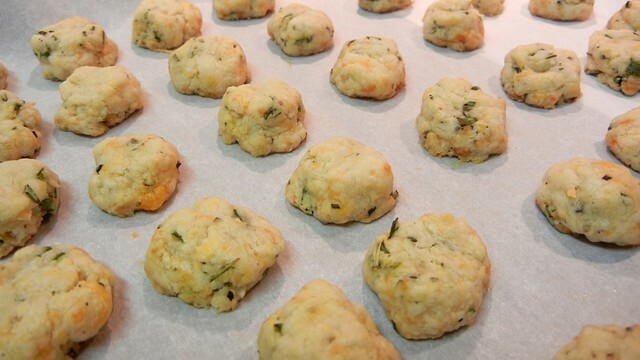 The rosemary really sets them apart from the Cheddar Bay Biscuits, as does the lack of garlic found in the RL’s ones. DID YOU KNOW: The summer between senior year of high school and my freshman year of college I worked at a Red Lobster because the YMCA day camp for special needs kids only paid us $300 for the ENTIRE SUMMER and I really needed some spending cash to go to college with? It’s true! I’d have to wash my uniforms the second I came home because they stank so much from the place. While I am sure it has changed, when I worked there the biscuits were made with this giant flour mix, cheddar mixed in and “garlic sauce” of sorts. I realize this is a *very* old post, but thought I’d add my thoughts here as I attempted to make these for the Super Bowl yesterday. I found it nearly impossible to get the dough wet enough to hold together as is. With a cup of flour and a stick of butter, it never incorporated fully. I tried using saran wrap to form it into a tight ball hoping it would hydrate during the rest period, but no luck. In the end, I ended up adding just a little splash of milk to get the dough workable enough to form into flattened rounds. Just figured I’d leave a comment in case anyone else is planning. 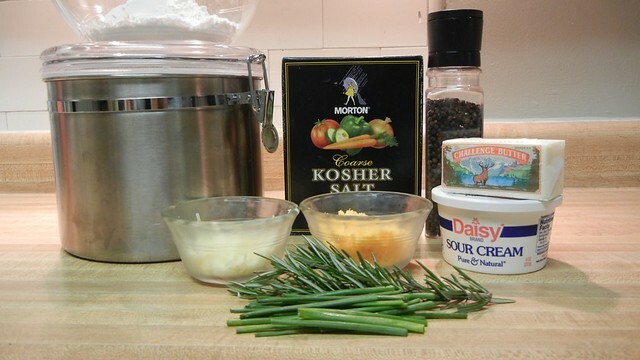 If you make the recipe as is and the dough isn’t coming together, it’s probably best to add something with moisture. Perhaps up the sour cream a bit, or if you happen to have milk or buttermilk on hand. But if you’re sitting there and you can’t get it to form, it’s better to add something before the dough rests.